Werewolf Beotan 4th Tesseran and Platoon Pack with unique free extra scout released! 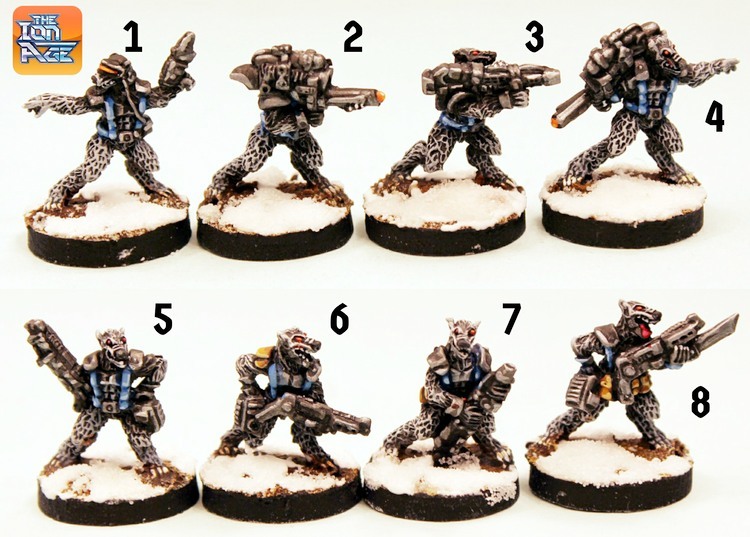 You have been most patient with us while we finished the thirty three poses of 15mm space werewolves and now the time is here. 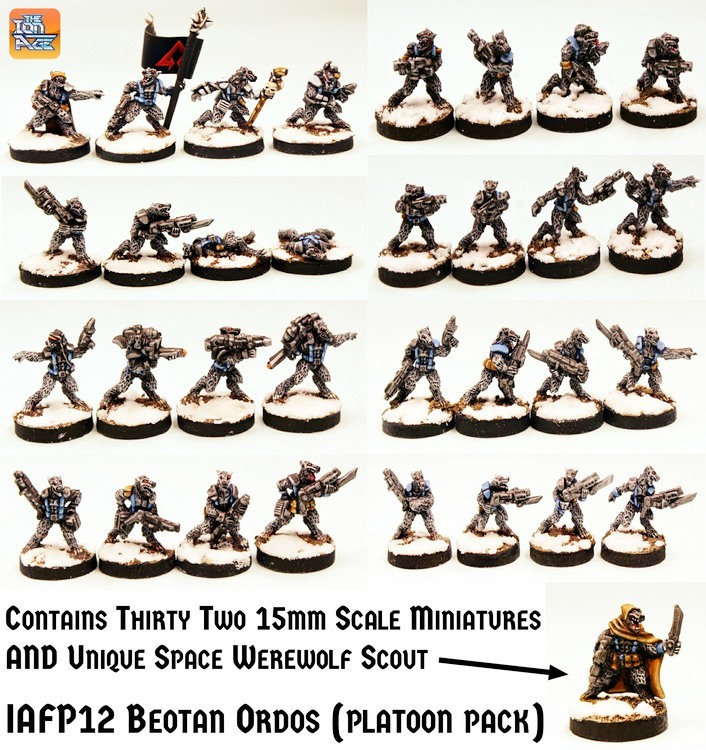 Following up on the three Tesserans of right from earlier this year we present to you all of our February 2018 releases with IAF155 Beotan 1st Tesseran (Juno Rifle) and IAFP12 Beotan Ordos (platoon pack). 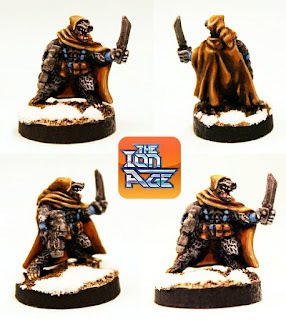 Core infantry and the whole force for the savage cold climes warriors of the Shia Khan Empire. Sculpted by Sam Croes. Go HERE or read on for more information. We are here with more space opera awesome! You can now field a whole Ordos of these fur covered fighters. Here are the details of the new and other codes for the Beotans. Go HERE. A Full Ordos (Platoon) of 15mm miniatures which includes a free unique miniature only found in this code which you can buy on its own too. A full Ordos of miniatures as well as an additional free unique miniature found only in this code. 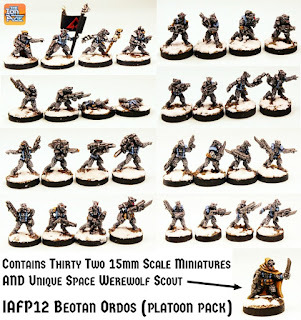 An Ordos of thirty two Beotans (space werewolves) composed of four Tesserans. 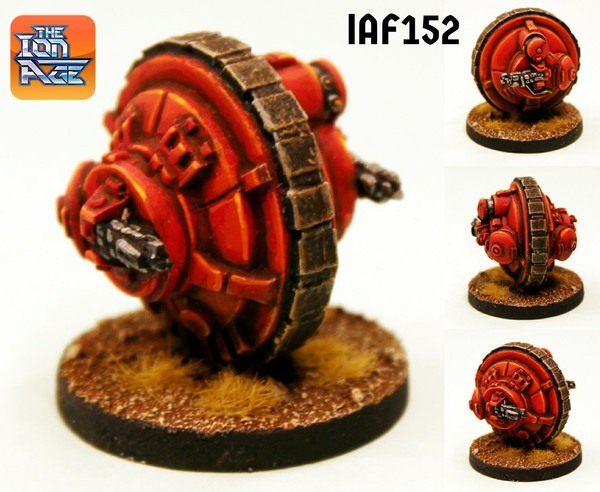 A full force for your wargaming table. This platoon pack is composed of the following packs: IAF155 Beotan 1st Tesseran (Juno Rifle), IAF148 Beotan 2nd Tesseran (Maia Mpi), IAF150 Beotan 3rd Tesseran (Support Weapons), IAF151 Beotan 4th Tesseran (Command and Casualties) plus Beotan Scout in cloak with sword and Honus Laser Rifle (Unique). Covered in fur and with reversed knee Beotans lope at high speed into battle and stand a little taller than a Human (17mm tall). 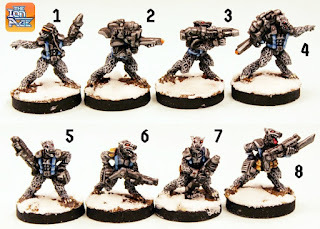 This code comprises thirty three different poses of 15mm scale white metal miniatures. You have the option of purchasing a pack or three packs with a 10% saving applied on screen as well as the unique miniature on its own. You can see the constituent parts of this platoon pack in the other codes as listed. Supplied Unpainted and without Bases. Go HERE. Price 24.00GBP per pack. This pack contains eight different poses of 15mm scale white metal miniatures. Beotans are Werewolves who dress in a combat harness and are used in cold climes and urban warfare. 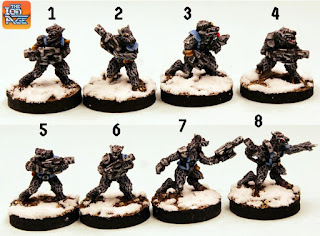 The first Tesseran contains the Ordos rifle trooper poses for your force. It is one of four Tesserans which make up a Beotan Ordos or platoon. Seven different discens armed with Juno Rifles and a low rank officer or trooper with Cupid Pistol and Juno Rifle. Covered in fur and with reversed knee they lope at high speed into battle and stand a little taller than a Human (17mm tall). You have the option of purchasing a pack or three packs saving 10% or single poses from the pack for your collection. Go HERE. Price 6.00GBP per pack. This pack contains eight different poses of 15mm scale white metal miniatures. Beotans are Werewolves who dress in a combat harness and are used in cold climes and urban warfare. The third Tesseran contains the Ordos support poses for your force. It is one of four Tesserans which make up a Beotan Ordos or platoon. 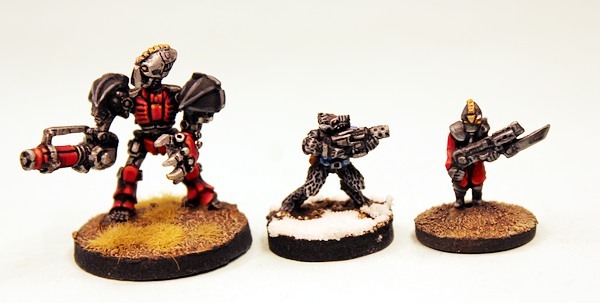 Two Apollo 40Kw Atomic Destablisers, two Jupiter 46mm Plasma Rifles, three Loaders armed with Juno Rifles and a low rank officer with enhance visor and Cupid pistol. You have the option of purchasing a pack or three packs saving 10% or single poses from the pack for your collection. Price 6.00GBP per pack. 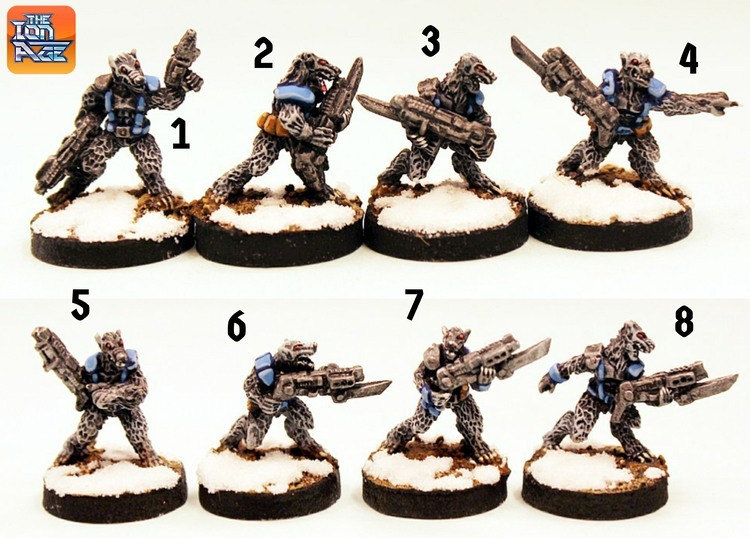 This pack contains eight different poses of 15mm scale white metal miniatures. Beotans are Werewolves who dress in a combat harness and are used in cold climes and urban warfare. The fourth Tesseran contains the Ordos command and special poses for your force. It is one of four Tesserans which make up a Beotan Ordos or platoon. An officer with enhance visor and Mia Mpi, banner bearer with pole topped with Retained helmet (pole is supplied bare without banner), Medic with staff and gear, Comms specialist with Cupid pistol, two different Troopers with Juno Rifle and two dead Beotans one face up and one face down. You have the option of purchasing a pack or three packs saving 10% or single poses from the pack for your collection. Price 6.00GBP per pack. 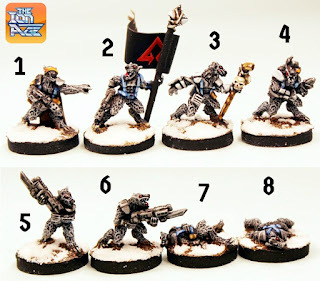 This pack contains eight different poses of 15mm scale white metal miniatures. Beotans are Werewolves who dress in a combat harness and are used in cold climes and urban warfare. The second Tesseran is armed with Mia 9.2mm Mpi close range weapons and is composed of troopers and a low level officer. It is one of four Tesserans which make up a Beotan Ordos or platoon. You have the option of purchasing a pack or three packs saving 10% or single poses from the pack for your collection. Price 6.00GBP per pack. How does a Beotan compare to a Human miniature in terms of its size. See below! While we were taking the photos for the new miniatures we played a game of Patrol Angis and here are two photos from that scenario. As you can see two Retained Knight gun crew on a Moth 88 Espatan Portable Weapon Platform fail to hold off a charge by Beotans upon their position. Beotans encircle an Adder Combat car with its dead Muster crew laying next to it. The Adder Combat Car is an Orange type with grenade launcher turret which has been modified with additional baggage and parts from our Vehicle Conversion Pack to make it an extended recon car. If you are keen on the forces of the Shia Khan Empire then check out all of their infantry and portable weapons HERE and all of their vehicles HERE in 15mm scale. 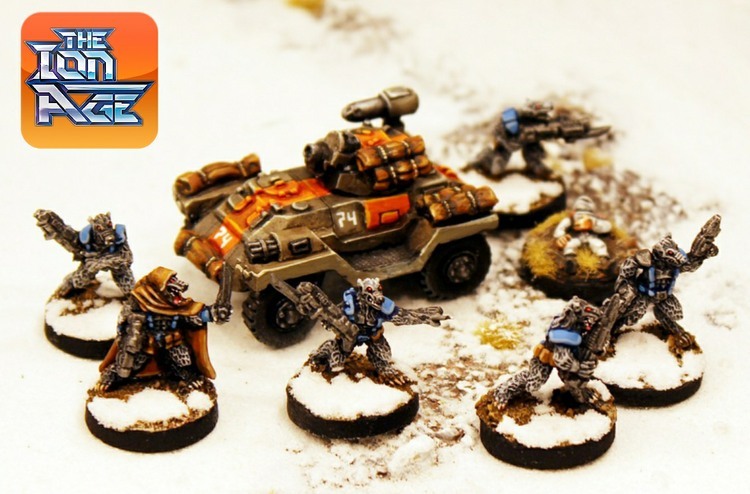 If you play Patrol Angis then you will need all three of the current books to make full use of the Khanate aliens; see them HERE. We will see you again in March with more new releases for the range and we will be switching back to the Prydian Army now that the Khanate have been dramatically increased in their available choices. But before that one more free article will be happening during this month so keep an eye out for that. Remember you get Reward Points added to your account every time you order from us and these can be used for discounts and special items at any time; 100 Free on your first order. Extra value! 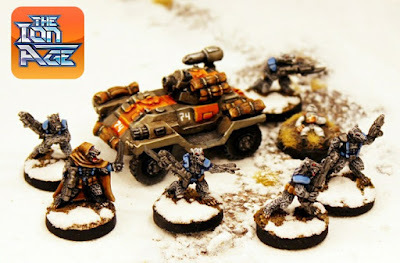 Lastly if you want to discuss Ion Age or our miniatures in your collection or see what is going on then join our Alternative Armies Tabletop Gaming group on Facebook.